If you’ve noticed a bit of extra snap, crackle, and pop in the air these days, you’re not alone. The coziest of seasons offers many joys, from hot baths and fireside chats to fragrant tea and comforting soups. But while winter brings twinkly lights, cozy jackets, and chilly walks in the frosty air, the colder months can also wreak havoc on your skin. That makes skin hydration during wintertime more important than any other season. Or should we say skin re-hydration, given how much moisture we lose on a normal day in the winter. With the heater on constantly and the air so dry you can feel the static electricity, it’s easy for your skin to lose its water content to your surroundings. Believe it or not, dry skin can also become oilier. Your body depends on a certain level of moisture to keep it healthy and balanced. When skin gets too dry, skin can overreact and begin producing higher-than-normal quantities of sebum, or the body’s natural skin-protectant system. That can lead to a shiny complexion, acne, and other related symptoms – even if you haven’t had a breakout in years or decades. The takeaway? It’s time to put that water back where it belongs. That’s where these simple skin hydration tips come in. The following no-nonsense steps are fewer action items and more lifestyle changes that will help you keep your skin feeling great. Depending on your skin type, you may have opted out of those thicker, oil-based moisturizers long ago. 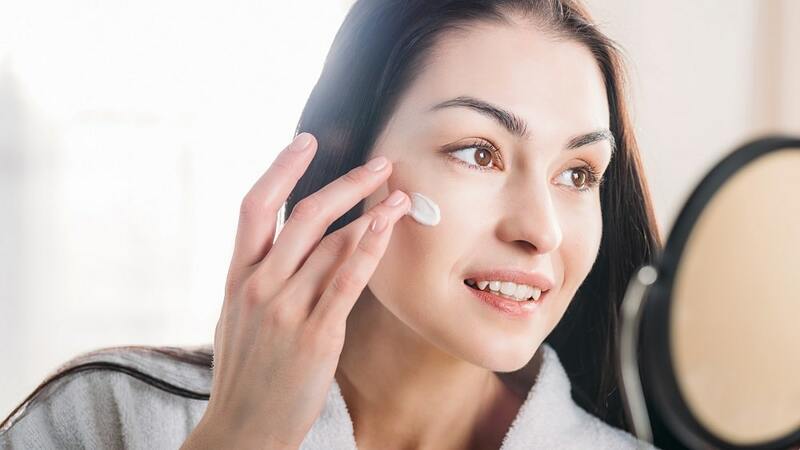 If you have large pores, oily skin, and a tendency toward flareups, it makes good sense to steer clear of applying those thicker creams, especially to your face. This keeps your skin balanced and will keep you from adding excess oil to your system. However, if you live somewhere that gets snow – think the Northeastern United States, the high deserts in the Southwest, or anywhere else in the world that sees major winter moisture loss – when dryness sets in, it’s important to rethink your skincare regimen and add moisture back in – just make sure it’s the right kind. The loss of protective oils on the skins surface results in moisture loss and dry, itchy skin. On top of that, hot water, soap, caffeine ingestion, central-heating, age, heavy layers of clothing (like wool), and certain geographic locations all have an impact on how much moisture your skin retains. By using a lipid barrier recovery cream or an AM+PM intensely nourishing facial moisturizer for the worst months of winter, it will help to provide rich hydration to the upper layers of the skin and restore the good fats (or four key lipids) responsible for the skin’s protective barrier. This will help you avoid dryness, which will, in turn, help you avoid an over-production of oil. Even if you have balanced skin, it’s smart to incorporate a lipid barrier cream into your daily skincare routine to help restore skin and the fragile barrier layer. Also, make sure to moisturize immediately following your exit from the shower or if you wash your face in the morning or before bed. Note that the goal of moisturizer isn’t actually to provide the moisture, but to provide a barrier that locks it in. You only have about three minutes after washing before all that moisture you just added evaporates and dries out your face. To achieve proper skin hydration, make sure this is the first thing you do after toweling off. Winter is cold – and when you’re cold, all you want is to get warm as quickly as possible. At no time of year is a piping hot shower more appealing. The same goes for a boiling bath and a raging fire. But exposing your body to all that heat isn’t good for you. More specifically, it’s not good for your complexion. Hot water washes away the skin’s protective shield, meaning the natural oils it uses to protect itself from the weather, dirt particles, and other irritants. When that happens, your skin is more likely to become sensitive to touch, moisturizers and makeup (which is why some products will burn when you apply them after the shower), and to continuous dry weather. The skin hydration solution is pretty simple here: Start taking cooler showers. Dermatologists recommend “lukewarm” showers, but that’s not as brutal as it sounds. While most people consider “lukewarm” to be room temperature, it’s actually 98.6 degrees or your body’s normal core temperature. Heat some water on the stove with a thermometer, then stick your finger in when it’s around 100 degrees – that’s the temperature you should aim for when you bathe. Running a humidifier in your bedroom or living room at night. This adds more moisture content to the air overall and reduces the drying effects of the heater. Drinking your recommended eight glasses of water a day, or more if you feel the need. Eating fruits and veggies that are rich in moisture content, such as apples and pears, oranges, celery, tomatoes, and other watery veggies. Wearing socks and leggings to keep moisture inside the body during the night. The last tip is especially important to keep in mind after you’ve moisturized. If you climb into bed and roll around in the sheets, you wipe that moisture right back off. Instead, lock it in with clothing. As for the other tips, try to incorporate one of these per week this winter and see if you can forge a new routine in the next several months. Microneedling has developed a solid reputation in the last several years. It’s simple, easy to do at home, and inexpensive, which leads some people to wonder exactly how it works. In a nutshell, microneedling delivers hundreds of tiny pinpricks to the surface of the face. It’s not enough to hurt or cause damage to the skin, but it is enough to tell your body that your skin is injured, activating its restorative responses. It immediately sends fresh blood, healing agents, nutrients, and (you guessed it!) water to the area. However, in order to make the most of your microneedling session, it’s important to incorporate the proper aftercare treatment into your routine. Microneedling tells your skin that you need all the ingredients of reparation immediately, and that means hydration too. So, your skin may feel drier than normal. This is when you’ll want to moisturize and give your skin the moisture it’s craving. Once the moisturizer is applied, water will rush to the site, skin cells will plump up, become bouncier, and begin to glow (thanks to all that fresh blood circulating underneath). Plus, over time, the more rapid cell turnover helps to even out the skin and enhance the appearance of youthfulness. There are many different microneedling devices out there so it’s best to do your research and find one that’s safe and easy to use. They even come in sizes that are perfect for those people with an on-the-go lifestyle. In the meantime, best of luck with these skin hydration tips – or as we said before, lifestyle changes. With just a few minor shifts in your skin care approach, you can maximize your skin’s potential at any age, so don’t wait to try them today! I can’t get used to wash my face and body with warm water instead of hot 🙂 We all love a steamy shower, breaks my heart to find out it’s not good for skin. A lot of skin-related issues can start with one dry winter and lack of attention for its consequences. I like to switch to heavier moisturizers during the cold season, I think they are giving more protection to the skin. Cold and dryness can be quite harmful. Great recommendations, thank you. I’ll definitely try some of these. A humidifier is a must-have if you live in the area with dry air. This small item has literally saved my skin last winter. It’s also more pleasant to breathe (if that even makes sense) when you have normal air humidity at home. Dear Kali, I agree, it’s an amazing addition to moisturizing “on the outside”.